The importance of quality self-talk and how to reverse the damage you’re doing to achieve mental toughness. Changing your beliefs and thinking patterns to support the outcomes you desire. Practical tips and actions to build-up your mental toughness muscle. Further reading, studies and resource links around increasing mental toughness. There are all kinds of toughness and the most visible is physical toughness, but I’d argue the more valuable is mental toughness. Physical toughness reminds us of athletes with tuned muscles that allow them to run faster, hit harder, endure or lift more. But mental toughness is what they use and need to get them to be master’s of their own bodies and thinking. Physical toughness can deplete over the years as we get older, but mental toughness can endure until our last breath. But getting it doesn’t come easy, and it can mean shaking off ghosts of attitudes and perspectives that undermine how we view ourselves and the outside world. Our type of self-talk is an excellent indicator of where we are in our mental toughness campaign. Psychologists and neuroscientists estimate individuals engage themselves in self-talk at an average rate of 150-300 words per minute. That’s a lot of words running through your brain everyday – 45,000-51,000! And depending on the type of self-talk it can directly impact your ability to develop mental toughness . You see your brain is set up with neural pathways which create highways as you take in new information or talk to yourself? That’s right! You have ‘self-talk highways’ in your brain you become familiar with over time. In fact, you become so familiar with them they get imprinted in your mind! By engaging in your ‘self-talk’, these prominent neural pathways become etched in your brain whether they’re positive or negative. If you have positive thoughts, they get stamped on the positive highway. Conversely, when you have negative thoughts they get engraved on the negative highway. You get so good at this over time you literally put your thoughts on autopilot. Your ‘thoughts’ self-drive you onto the neuropathway you’re accustomed to using, albeit good or bad. Just as you can become a creature of habit with your driving, so you can also become a creature of habit by the way you think. The bottom line here is which lane of the road you choose to ride your thinking onto: the good, or the bad lane? Negative thinkers automatically drive in the negative lane of the highway without even realizing they’ve crawled onto the ramp. This is because they’ve developed negative thinking patterns for so long. On the other hand, positive thinkers know how to control their thoughts by scrutinizing and recognizing their negative thoughts, and heading them off before they lead them astray. They take control of the wheel of their mind and imagination at all times, and choose to drive in the positive lane. Just as you build muscles in your body, you build ‘mental muscles’ by exercising them with the way you continually think. These ‘mental muscles’ get stronger over time and possess a ‘muscle memory’ or mental toughness. WHAT IS SELF-TALK AND MENTAL TOUGHNESS? 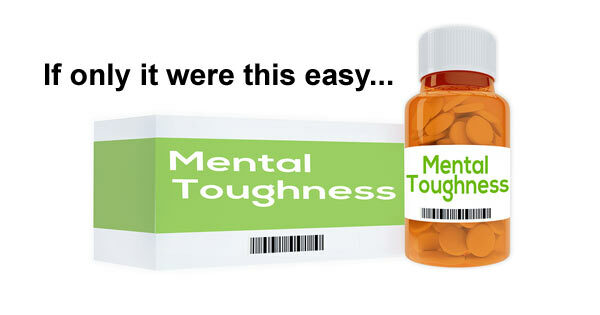 There are different views on how and what constitutes mental toughness. Some experts on positive thinking might assert mental toughness is having the ability to control your thoughts. When a negative thought flows into your mind, you quickly identify it and remove it before it can take root, and lead you to a chain of negative thinking patterns. You might call this ‘taking your thoughts captive’, in that you control your thoughts. It’s actually more difficult than most people think because many people become ‘lazy thinkers’, they just casually go with the flow of thoughts as they pop into their heads. But mental toughness asserts one must take direct control and inventory over their thoughts. You just don’t let them free-flow as they come into your mind. Instead, you notice them as being active, assess them, and make the proper change to them. Since this takes work, almost like going to the gym and building physical muscles, most people shy away from making this change because it takes time and effort on their part. Interestingly, what they don’t realize is it took time and effort in the beginning to put them in a negative mind set. If they apply the same principles, but reversing the way they think for a short period of time, then they can change the way they think for the long haul. Mental toughness is becoming aware – an awareness of your continual thinking patterns – of unfavorable or negative ones. To be mentally tough, you need to engage yourself by creating awareness of your self-talk. What are you telling yourself about through your thoughts and actions? All thoughts we have can best be described as ‘self-talk’. We speak to ourselves in microseconds before we even speak out loud. In fact, most times we don’t even speak out loud what we’re thinking, especially when we’re alone, or in a situation where we’ve to remain quiet. Even though we don’t speak, we still think – we continually talk to ourselves visa vie by the thoughts we have. At the beginning of this article I said psychologists estimate people engages in self-talk roughly at the rate of 150-300 words per minute? Too many people are perfectionists in their self-talk. They’re constantly criticizing themselves for thinking, acting or ‘being’ a certain way. This undermines mental toughness as they become their own worst audience, constantly listening to their deprecating thoughts. It never seems to let up, rather they keep the cycle of analyzing – criticizing going on in your head… keeping the negative neuropathways alive by constantly “burning rubber” on them! Are you familiar with the term, ‘Paralyses by Analysis?’ This means you continually brow-beat, over-think, analyze until your “blue in the face”, or ponder things to a “pulp” until your brain/mind is tired of thinking about it. Often times this leads to mental burnout. Before it ever gets to the mental burnout stage, it leads to, and creates, negative thinking patterns based on the rehashing and mental rehearsal of negative thinking. Perfectionist thinking ironically then undermines mental toughness, rather than, as perfectionist-thinking talk goes, strengthens resolve by being “tough” on themselves. Interestingly, the more you try to be ‘the perfect thinker’, the more you seek out flaws or negative aspects for the way you’re thinking. It becomes a vicious cycle as you get caught up in a ‘thinking loop’. You’re like a dog chasing its own tail, and you go around in circles in your mind. The wise dog knows its tail belongs to them and identifies it as such and moves forward. The same should be done with thoughts and choices. Once they’re made, you move forward. This is a sign of mental toughness! 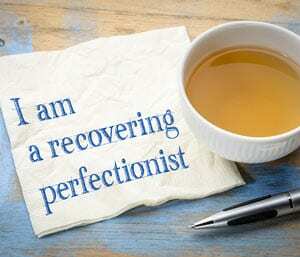 How do you know if you’re a perfectionist or not? For starters, do you include the following words when you are self-talking; should, must, better, always, have to, one hundred percent, only one way, when referring to yourself and how you should be? If you do, then you’re using absolute terms to define you, and how you should speak, act, or perform, in front of others, including yourself. This creates an immense amount of pressure on yourself! When you engage in this type of thinking, it’s hard to let the tiniest of mistakes go. You may like to think you’re ‘mentally tough’ by thinking about something over and over, however it’s quite opposite. In this situation though you’re not mastering your thoughts but instead your thoughts are ‘mastering’ and controlling you. You become the dog chasing its own tail around in a circle! The root cause of lacking mental toughness is individuals becoming fixated in their negative, habituated thinking patterns. Over time the thought process becomes etched in stone on negative neural pathways. These places an individual in a position of weakness when it comes to their own thinking patterns and styles. Does habituated thinking have to be this way in your life? Only then, will this motivate you to produce the changes you want! 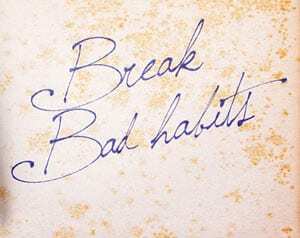 In an earlier article “Pattern Interrupt – Breaking the Habit”  I talk about a method of overcoming habituated thinking patterns using pattern interrupt. It’s a common technique used to change habits. Examples of natural interrupt which happen on a daily basis are unexpected noises, movements, other people talking, or when we engage in activities that relax or calm such as working out, going for a long walk, meditating, or even taking a different route to or from work. Basically, anything that helps get us out of a rut our current thinking has us in. But doing it deliberately is more difficult because it requires monitoring of your own thoughts and when you detect yourself slipping into a thinking pattern you want to change, catching what you’re doing, and interrupting it by “reversing direction” or doing an activity that forces you to concentrate on something else. Practice makes pattern interrupt a viable solution for helping with mental toughness when it comes to changing the way you think. MENTAL TOUGHNESS – TIPS TO IMPROVE IT! In order to become mentally tough, you’re going to have to change the way you think, which will create changes in the ways you feel and behave. This can and will be achieved in a variety of ways, but will only come about when you’re committed to making these changes! You need to own your thoughts! Always remember you’ve the right to think whatever you want. The truest mark of mental toughness is learning to think for yourself. True, many of us are influenced by what others are telling us on a daily basis, especially messages from loved ones, or those closest to us. At the end of the day, you have to live with yourself, what you think and the outcome of the decisions you make. Make decisions based on the thoughts you choose! Always keep things in their proper perspective! Too many people live with ‘end of the world” mentalities when something goes wrong in their lives after making a decision. Everyone makes mistakes and even the strongest thinkers with the best mental toughness will make mistakes. Mental toughness is about keeping things in perspective and then moving on. Don’t let mistakes define you, or dictate your future! Always do your best to live in the present! Remember, the only thing you’re in control of is the present moment. Thinking and worrying about the past won’t change it. You can only focus on what and how you’re thinking about in the present moment. See yesterday as the past no matter what, and move on to tomorrow as you will always have things to do, with places to go and people to see! Focus on the positives! There have to be things you’ve done well in your life throughout. You didn’t get as far as today because you made a ton of mistakes and never learned from them. If you’re going to focus on anything from your past, focus on your successes and achievements. Use them as inspiration and motivation to move you toward achieving new and better successes! Deal with your setbacks in a positive manner! To be successful, you need to overcome your setbacks and learn from them. Everyone will make mistakes at things they try. The key is to re-define and label your ‘setbacks’ as feedback or learning experiences. Use them as opportunities to change the way you think and act. Remember, as Thomas Edison put it best while inventing the light bulb – “I have not failed. I’ve just found 10,000 ways that won’t work.” Too many people don’t realize how close they are to achieving goals or dreams, when it’s truly within their grasp! It’s never easy to live with mistakes, especially when they impact you and loved ones in a significant way. Dealing with your own thought process and self-talk is extremely important for determining how fast you’ll bounce back, and also for dealing with mistakes you may encounter in the future. CAN HYPNOSIS WORK TO CREATE MENTAL TOUGHNESS? Training your thinking to be mentally tough can be challenging. Most people grow comfortable and even stagnant in their negative thinking patterns, which do more damage than good. Using hypnosis to create mental toughness can help you break free from the patterns that weaken your thinking! 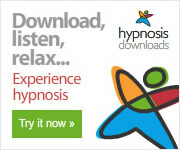 How does hypnosis work then? It stimulates the mind to create a new set of cognitive scripts by tapping into your unconscious mind. One’s unconscious mind goes on autopilot and takes you down the same neuropathways. Hypnosis has the ability to disrupt your ‘auto pilot’ negative thinking patterns. It’ll help to create new positive pathways. These new pathways will help create positive thinking! It pushes you in a new direction in which the thoughts you now create will be different! The findings of the study “indicate that implementation of integrated mental training in everyday life offers a practical tool having sustained impact on physiological and psychological well-being. By managing and conditioning changes in perception and emotional responses, a substantial affective balance in cortisol/DHEA-S ratio can be achieved with considerable effects on stress reduction, emotional stability, performance and health outcomes” . This scientific study provides insight into the benefits of mental training and how it can impact our body chemicals which help with mental toughness training. The use of self-hypnosis in the study demonstrates a method of helping to implement a mental toughness program. Self-hypnosis can be learned, and most professional hypnotists can teach it. Contact some local hypnotherapists and discuss your goals with them and choose one with experience in developing mental toughness in others and you feel is a good match for you. Building mental toughness is about exercising your brain muscle. As physical exercise grows our body muscles so we get stronger and can run faster for longer, so, challenging your thoughts and beliefs supports mental growth and provides the basis for increasing mental toughness. High performing athletes adopt training for both physical and mental toughness. The quality of our self-talk is critical to turning an attitude steeped in negative talk to one of achieving positive outcomes by changing the words we use in self-talk. Learning from mistakes and looking for improvement is positive but looking for perfection for most if us usually translates into “trashing ourselves”, and makes us mentally vulnerable instead of tough. Changing our self-talk to be more positive is one step, but equally important step is our beliefs and patterns. Constant negative self-talk is usually an outcome of beliefs as this leads to patterns of talk and behavior impacting our growth of mental toughness. So, beliefs about ourselves and changing those to be more supportive of our “new you” will in turn change our self-talk. The link between beliefs and self-talk is strong and each compliments the other in an interactive process. At first change can be small but expands exponentially as self-esteem and confidence grows.